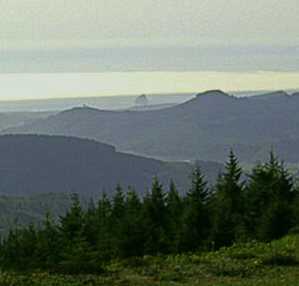 From the top of Mount Hebo you may see the five major mountain peeks of the Cascade Mountain Range. In Oregon, Mount Jefferson and Mount Hood. In Washington, Mount Adams, Mount Saint Helens and Mount Rainier. Pictured here facing the Pacific Ocean, near Pacific City, OR., you will see Haystack Rock and Cape Kiwanda. Mount Hebo is 3,164 feet high. The road is steep and windy but well maintained. Beware of crazy drivers coming around the blind corners to fast! It is 12.3 miles to the very top. At 7.4 miles on your right you will see the Mount Hebo Lake Campground, bear left and in short 3 miles you will be at the top for a very spectacular view.